A Kalamazoo grill lets you do exactly what your parents told you not to do - play with fire. 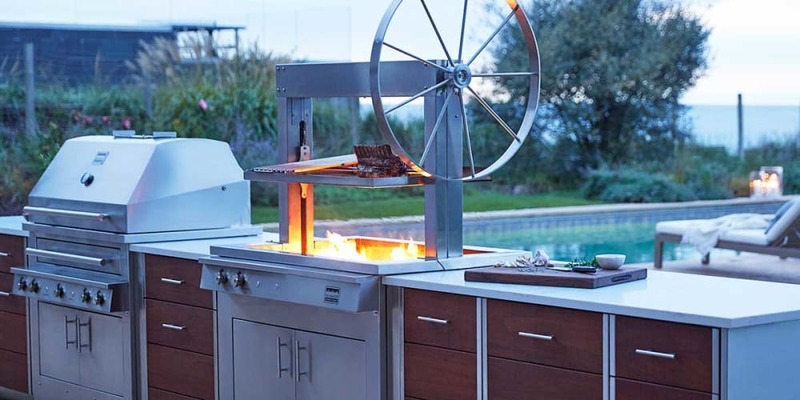 This BBQ grill is designed to have maximum fun cooking on gas, charcoal, or wood; or all three at the same time. You can build your entire outdoor kitchen around Kalamazoo products. The pizza oven (a kids favorite), gaucho grill (that will transform you into an Argentinian cowboy), smoker, undercounter refrigerator, and storage cabinets are all weatherproof and built to last. In fact, Kalamazoo is so confident with their craft that they back it up with a transferable 25-year warranty. Starting from the moment you begin your research through to Kalamazoo outdoor kitchen installation and over the many grilling years to come, Kalamazoo is there for you. Kalamazoo knows that designing your outdoor space sometimes requires options and ideas, so they offer end-to-end design support for free. The “design studio” can turn your outdoor vision into a blueprint that is ready for your landscaper to make into a reality. Become a Kalamazoo grill master, have fun and create lasting memories by becoming part of the Kalamazoo cooking community. Grill Area 23"x22" / 506 sqin. 33"x22" / 726 sqin. 46"x22" / 1,012 sqin. Total Width 28 in. 38 in. 51 in. Marin-Grade Stainless Avail. Avail. Avail. PRO TIP - Make sure to contact our staff at (888) 714-4938 to help you design your dream outdoor kitchen. Kalamazoo Pizza Oven Precise temperature controls make it ideal for all pizza types Neapolitan, New York, Chicago-style, or Calzones. Fastest up time - reaches 800 F in 1/2hr. Prepare pizzas in 2-3 minutes. Two burners, one for the top and one for the bottom. Ideal for many other food types. A Kalamazoo grill lets you cook using your choice of charcoal, wood, or gas. Either choose one or combine them to experiment and have fun cooking. No need to mess with lighter fluid or voodoo techniques passed on from friends. Just press the button to activate the dedicated burner that lights up coal or wood easily. This feature alone will make you a hero in the neighborhood. A Kalamazoo grill allows you to control the temperature precisely between 250 and 1,000 Fahrenheit. The hybrid grill is hot enough that you do not even need a sear burner. Just to give you a reference point, your father's old Weber used to get 500-550 Fahrenheit hot. Most pro-grills cannot reach 1,000 degrees even with dedicated sear burners. This grill does that plus gives you the ability to control the cooking process. There are cast bronze Dragon burners underneath the drawers for the wood and coal, providing intense heat. Each of the burners weighs more than 14 pounds and is one-eighth-inches thick. Their unique design allows these burners to thwart the ash or cooking juices dripping from above. Kalamazoo grills do not have internal lights. This is a result of the high operating temperatures that these BBQs reach and the fact that commercially available light bulbs simply cannot withstand those extremes. The smart design of a Kalamazoo grill ensures air circulation, both below and above its cooking surface. That is the case regardless of the chosen grill, including on built-in pro-grills. The grill features floor pans that sit between 27 and 29 inches under the cooking grates. In contrast, competitors only reach 10 inches deep. This extra depth delivers exceptional smoking and roasting capabilities thanks to the impressive heat circulation dynamics. The burners of a Kalamazoo grill are under the hybrid fire drawer, increasing the heating surface even more. The design also includes air vents by the grill’s top, assisting with precision for temperatures, particularly with coal or wood. If you are smoking food or want to enhance flavor, use wet wood chips. You will love that you do not have to open the dome to open the grill’s hybrid fire drawer. Those who do not want cleanup to be an afterthought will love a Kalamazoo grill. Instead of a small grease tray, all Kalamazoo grills have large and deep cleanout bins that are easy to handle. To reduce the mess, this bin is in a sealed location by the bottom of the grill. To further help in the cleanup, the grill produces less ash because it operates in extremely high temperatures. The grill itself features 304 stainless steel for durability and protection from corrosion and oxidation. To further ease potential wear and tear, Kalamazoo engineers used marine-grade stainless steel for rivets and screws. That grade of stainless steel is known for its impressive durability in the toughest conditions. You can use a Kalamazoo grill to indirectly roast or grill with ease. The grill lets you roast a whole chicken in just 35 minutes. If you prefer to use indirect heat, try placing some charcoal or wood by the front of the grill or adjust the infrared burner. To ensure your roasting and cooking go off seamlessly, the grill comes with a cookbook with guides and recipes. You will find step-by-step instructions for recipes such as cooking a steak. That particular example includes everything, from searing it on direct heat to using the indirect heat zone. The goal is to ease and control regardless of temperature. Roast between 350 and 650 Fahrenheit or smoke low and slow between 200 and 300 Fahrenheit, depending on your preferences. Every Kalamazoo grill also features its own rotisserie, complete with a hidden motor. Hiding the motor helps the grill’s appearance and protects the motor to extend its life. The chain link to rotate meats is nice and discreet as well. The Kalamazoo grills are known for having laser cut surfaces that are a quarter inch. The specially designed plates reduce cooking time by as much as 50 percent by retaining heat. Laser Cut Surface for Meat: This is a flat surface that has a large opening that lets you expose your chosen meat to the flame for cooking. It works perfectly for steaks, burgers, and every other type of meat. Laser Cut Surface for Fish: This special surface has slightly smaller openings. That improves the solid surface area. The result is a surface that works to “pan sear” a steak, make stir fry, or cook your favorite delicate fish. Laser Cut Surface for Vegetables: This surface eliminates the need for a grill basket. Compared to the other Kalamazoo grill surfaces, this one has smaller openings. It is ideal for small vegetables, from beans to asparagus. Laser Cut Plancha Grill Surface: Finally, this surface is a solid quarter-inch thick and is perfect for teppanyaki, diner-style burgers, eggs, bacon, and pancakes. If you aren’t familiar with the idea of a plancha grill, it is similar to a griddle but with lower heat intensity on the edges and more heat in the middle. These grates are all optional and are based on your needs and your grill size. You can get any of them for $375 a piece for your Kalamazoo grill. Flare-ups that lead to inconsistent and frustrating grilling experiences are now a distant memory. Kalamazoo grills control flare-ups thanks to the lower placement of the burners and firebox. That reduces the risk of flames reaching the top of the grill’s grates, making it very unlikely. Since flare-ups occur when the grease or food reaches the flames, this almost eliminates flare-ups. A gaucho grill is the perfect Kalamazoo grill for those who want to maximize their fun while outside. This grill eliminates the hassle of lighting wood thanks to dedicated burners. It will heat up to your ideal temperature in 20 to 25 minutes, with variations based on your chosen wood or coal. While cooking, use the rotisserie with its hidden motor driving the chain. Or take advantage of the 30-inch spoked wheel that can raise or lower the cooking surface. Opt for a laser cut grill surface. Or you can use the ideal V-shaped grate with an Argentinian design, including a mess-eliminating drip pan. There are three models available. You can opt for a freestanding model with or without a side burner or a built-in gaucho grill. The Kalamazoo Pizza Oven is another excellent choice, especially when entertaining. The unique oven design, which features precise temperature controls and a hollow area beneath the pizza stone, responds quickly and precisely to changes in temperature. This allows the stone to heat to high temperatures in no time. Reaching 800 Fahrenheit only takes a half hour! No matter where you stand on the debate of coal oven vs. wood burning, Chicago vs. New York style, with Kalamazoo's pizza oven you can create a masterpiece that will easily surpass the best-in-class pizza out there. Entertaining is even more fun when guests craft their own favorite pizza, calzones or fresh fruit dessert pizzas. In addition to working well for pizza, the Kalamazoo grill also excels at baking bread, making fish and cooking other traditional BBQ sides like mac and cheese. For further versatility, there are separate burners. All of these options await your creativity and the grilling season fun has just begun. As soon as you open the hood using your Kalamazoo Grill’s Assisted Open, you will appreciate the unsurpassed quality of a grill built to last over the many grilling seasons to come. This iconic brand inspires a wide range of cooking and grilling styles, but best of all, the company offers great support, customer service and a community of grill masters who share fun tips and tricks. Share your latest creations with other culinary enthusiasts, spark your inner creativity, make Kalamazoo cooking part of your legacy, and create extraordinary outdoor memories today. Minimal. To maintain your Kalamazoo grill, make sure to clean the burners and the entire grill once a year. You should also cover up the grill and all of its elements during the winter months.